A total of nine logistics start-ups selected during the SIL and eDelivery Barcelona trade fairs participated in the programme. Barcelona, 15 January 2019. This morning, La Salle Campus Barcelona-URL innovation park, La Salle Technova Barcelona, and the Consorci de la Zona Franca de Barcelona officially closed their logistics market acceleration programme, eDelivery Accelerator. The closing ceremony was attended by Special State Delegate in the Consorci de la Zona Franca de Barcelona (CZFB) Pere Navarro and executive chairman of La Salle Technova Barcelona Josep Miquel Piqué. Nine international logistics start-ups participated in this 22-week programme, which started operating on the premises of La Salle Technova Barcelona in September. They worked on their B2B and B2C projects and were put in contact with the sector companies and investors to finance their growth. The first participants were nine international and national start-ups (two from London and one from Estonia), all selected at the Start-up Connection Hub during the eDelivery Barcelona fair last June. The start-ups were Freightalia, Gantabi, Revoolt Smart Solutions, SmartMonkey.IO, Tridenia, Outvio, Unmanned Life, Manzaning and Chaingo Tech. All of them provide innovative projects in this sectors of logistics, which introduce aspects like Big Data, Business Intelligence, Internet of Things and Artificial Intelligence into the process. Executive chairman Josep M. Piqué of La Salle Technova Barcelona said that “start-ups and established companies have taken part in the programme activities, sharing their understanding of what is needed and challenges to overcome in order to boost growth and add sophistication in physical product distribution to digital consumers. On the one hand, the start-ups explored organisational and service provision challenges facing companies accustomed to limited physical environments, while the companies were able to learn about digital strategies and services for optimising final distribution of products originating in online or traditional channels. The programme was also an opportunity to analyse the main competitive challenges facing established companies and to make improvements to business processes resolved by the start-ups”. Special State Delegate in the Consorci de la Zona Franca de Barcelona (CZFB) Pere Navarro and the chairman of SIL and eDelivery Barcelona ​​stressed that “the CZFB is a magnificent tool for economic transformation, whose essence is marked by innovation, social commitment and the spirit of teamwork. Projects like the eDelivery Incubation programme are a fine example of this”. Navarro also added that “in the run-up to the next edition of SIL and eDelivery Barcelona, we have worked in collaboration with La Salle Technova Barcelona to create a platform that concentrates the digital transformation of the retail, e-commerce, logistics and delivery sector, and will include an incubation and acceleration programme to further strengthen talent and boost creative innovation”. Anna Buil, communications director at Viena, one of the organisations taking part in the project, was enthusiastic about the initiative, adding that “it is an effective way of staying current with the trends and disruption triggered by the appearance of new technologies. These days, technological innovation is advancing at a dizzying speed, providing opportunities for growth that nobody can ignore, because they are already here. These sessions are a win-win opportunity for both start-ups and participating companies, since everyone benefits”, and, “we have been pleasantly surprised, finding solutions to the problems existing in our surroundings which are pertinent to projects we are working on now”, she adds. Many participants remarked on the high value of some training modules such as team leadership, financing and training in sales, and were particularly impressed by the networking opportunities and resulting relationships they had formed. In this regard, Ángel Sánchez from start-up Revoolt, explained that “potentially interesting collaborations have emerged for suppliers and customers with companies in the programme, which also led to the formation of a valuable network of contacts which will be valuable in the future”. Finally, the Special State Delegate in the CZFB, Pere Navarro, said that “the Consorci de la Zona Franca de Barcelona will continue to support emerging new uses, building synergies, business collaboration and projection of Barcelona and its Metropolitan area”. To see a photograph, click here. 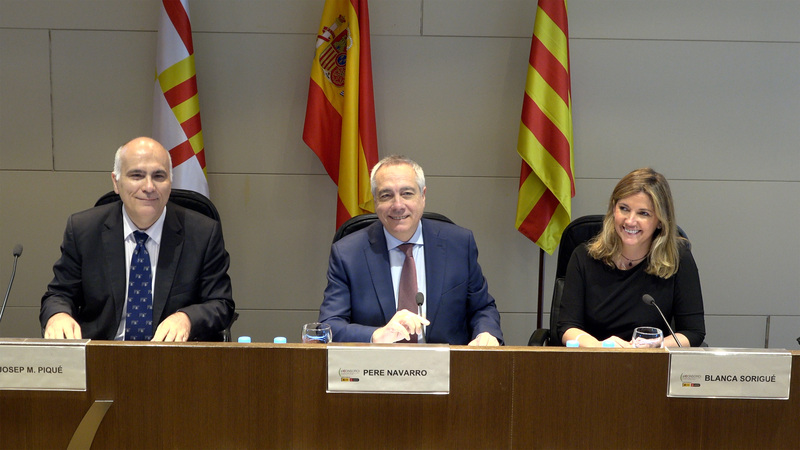 The photograph shows the closing ceremony, which was attended by the Special State Delegate in the CZFB, Pere Navarro, and executive chairman of La Salle Technova Barcelona, Josep Miquel Piqué.